The government is conducting a long-overdue review of the opaque, graft-riddled jade industry, which is dominated by powerful vested interests whose activities are costing Myanmar billions of dollars a year in lost revenue. AT THE jade shops of the Chinese city of Ruili, the silver-haired man was conspicuous in his longyi and tike pone – a traditional Myanmar jacket – among the crowd clad in pants and skirts. Known in Myanmar as Shweli, the town is across the border from Muse. It is known as “Jade City” because of the huge volumes of high-quality jadeite that pass through on the way to markets in China, where the precious green stone gouged from the earth in Myanmar is particularly coveted. Jade is one of the country’s most valuable natural resources but the industry is riddled with corruption and notoriously opaque. Trading in the stone can be a precarious business, as the silver-haired man well knows. “My life is gone,” said U Than Nyunt, 91, a native of Yangon Region’s outer southwestern Kawhmu Township and the patron of the Shweli Jewellers’ Association. He was referring to better times about 15 years ago when he owned four shops in Shweli’s busy jade market. He used an illegal transportation service to bring his stones, worth about five million yuan or K1 billion at current rates, to Shweli. But in Muse the authorities seized the illicit cargo. They told him that if he wanted it back, he would have to buy it back at an auction. Convinced it was a plot to have him arrested, Than Nyunt decided to forget about his jade. “I didn’t participate because I feared being arrested. So I had to let it go,” said Than Nyunt, who has since become a broker instead. Many traders have similar stories. Ko Yama, who runs the Nyein Soe San shop in Shweli’s jade market, also used an illegal transport company to move his raw jade to the border crossing at Jiegao, a few kilometres from Shweli. His jade was confiscated by Myanmar officials in Muse; the loss “destroyed his life”, he said. So why do traders use illegal channels? While traders and businesses want to avoid tax, many government officials involved in the sector also discourage legal trade, instead accepting bribes to facilitate illegal activity. Than Nyunt is a veteran among the estimated 30,000 Myanmar who have moved to China to work in the jade trade. He said it was much easier doing business there than in Myanmar. “China is business minded; anyone can do business that is profitable as long as you pay the due tax,” he said. In Myanmar, Than Nyunt said, if you want to do business in jade you have to buy from the gems and jade emporiums jointly sponsored by the government and big jade mining companies, and either resell the stone or make it into jewellery. There are powerful interests involved in the jade trade that can be dangerous for smaller players. “In Myanmar, we have to fear this man and that man. How can we do business in such a situation? It is like we were kicked out of the market in our own land to a foreign land,” said U Phone Kyaw, chairman of the Myanmar Merchants’ Association in Shweli, which he has called home for 24 years since moving from Yangon’s Tarmwe Township. Traders also complain about the inconvenience of meeting their tax obligations, although the government has opened offices in Yangon, Mandalay and the Kachin State capital Myitkyina to streamline payments. “If you want to do the business legally, you will have to pay big companies and pay the tax,” said U Zaw Zaw, a businessman from Mandalay. Paying tax is complicated, he said, and encourages tax avoidance and illegal activity. He said the buyer must go and show the jewellery at the checkpoint in Mandalay using a company licensed to trade jade, and then pay the tax. The buyer then gets a receipt that they need to show when leaving the country. Although officials at the Mandalay tax checkpoint told Frontier that attaining a jade trading licence is easy, industry sources said this was not true. According to Zaw Zaw and other traders, it requires large illicit payments to government officials. Because only a few traders have access to a licence, the rest pay them a service fee to piggy-back on their licence to get the necessary permissions. A change in the tax regime this year has also had a big effect on the jade industry and has been blamed for a decline in sales at the last Gems Emporium, in August. At the start of the fiscal year, the government included gems and jade on a list of special commodities, making them liable to a sales tax of 15 percent, up from 10 percent. Sellers also pay a three percent levy to the central committee of the Gems Emporium, which organises the events. The August event was reported to have realised sales of jade and gems totalling more than €500 million, or about K796 billion. Last year the emporium achieved sales of €533, against a target of €1billion. In 2015, sales totalled more than €900 million. The rise in the sales tax is not the only factor affecting government revenue. The inconvenience of meeting other tax obligations and the industry’s notorious lack of transparency are all contributing to the revenue losses from traders who rely on the black market and smuggling operations. It’s much easier to do business on the Chinese side of the border, say Myanmar jade traders in Shweli. “Here, they are open to all the incoming natural resources from Myanmar. You can take it anywhere legally,” said Ko Yama, the jade shop owner in Shweli. “It is quite obvious that the Chinese are hungry for natural resources. But both the Myanmar government and business owners just focus on digging up large amounts of resources to export,” Yama told Frontier. “They are mining without discipline and exporting at cheap prices. They blast and dig up entire mountains and send the jade here. They are destroying the whole market without our country receiving the revenue to which it is entitled,” he said. The government is drafting a policy for the jade mining industry that covers the entire process, from the granting of licences to export of raw and value-added products. 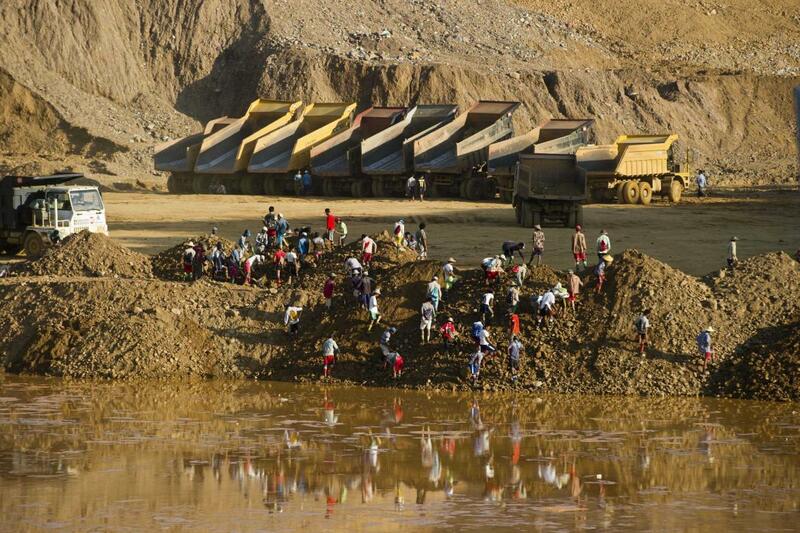 The policy is being drafted by a group comprising government official, local and international civil society groups, and members of the Myanmar Extractive Industries Transparency Initiative, said U Min Thu, deputy director of the Myanmar Gems Enterprise and secretary of the Myanmar Jade Committee. The group has conducted numerous field visits and interviewed a range of people involved in the sector, he added. The National League for Democracy government has been trying to reform the jade and gem mining industry but it’s a slow process. In July 2016, the government suspended the issuing of jade and gem mining licences, partly because of environment concerns, pending an industry review. Further changes to the Gemstones Law, which was amended in January 2016, are also being considered by parliament. In a criticism of the proposed amendments early this year, the National Resources Governance Institute, a New York-based think tank, said they failed to address Myanmar’s outdated fiscal framework, opaque licensing procedures, and conflicts of interest among regulatory institutions, “three deficiencies that perpetuate chronic corruption, violence, and environmental degradation in the gemstone sector”. A commentary by NRGI associate Mr Paul Shortell published in the Myanmar Times on January 25, 2017, said that when the junta enacted the Myanmar Gemstone Law in 1995 and established special institutions to oversee the jade and gems sector, it isolated it from the rest of the mining industry, which is under the Myanmar Mines Law. The commentary argued in favour of a single mining code. It said that increasingly few countries have a separate gemstones law and noted that where such legislation has been adopted, such as Angola, it has often helped to consolidate the control of powerful vested interests. “The question stakeholders should begin by asking is not just how to amend Myanmar’s gemstone law, but whether Myanmar needs a gemstone law at all,” the commentary said. U Min Thu, deputy director of the Myanmar Gems Enterprise and secretary of the Myanmar Jade Committee, acknowledged that a lack of clear policy has created challenges. “Formerly, as there was no policy, we had to run on experience and change according to the situation,” he told Frontier. The vast scale of the illegal jade trade has robbed Myanmar and its people of billions of dollars in lost revenue, said a report released in October 2015 by London-based watchdog group, Global Witness. In an exposé that followed a year-long investigation, Global Witness estimated that jade production reached as much as US$31 billion in 2014, when China officially imported $12 billion worth of the precious stone. The watchdog said the jade industry in Myanmar may be the world’s “biggest natural resource heist”, and was controlled by networks of military elites, drug lords and crony companies. Global Witness analyst Ms Juman Kubba said $31 billion was “the equivalent of almost half of the country’s GDP and almost 46 times the amount spent on health in Myanmar last year”. “It’s a staggering amount,” she said, in a news release accompanying the release of the report in 2015. “A single kilogram of the highest priced jade sold at the 2014 [Gems] emporium would have generated enough revenue to fund 147 health clinics in Kachin State for one year,” the report said.